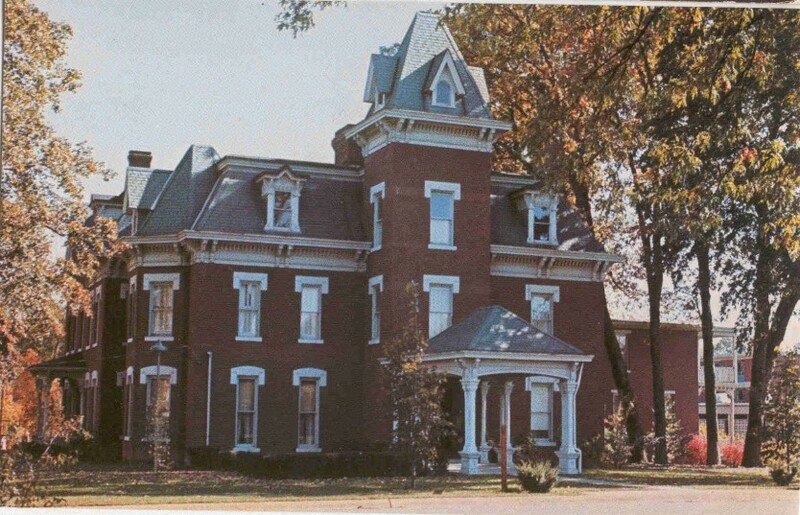 Today’s “House on the Hill,” as this mansion is known, is one of the most intact historic homes in Rock Island. It was owned by one family for most of its life and, subsequently, by Augustana College, which has been a loving custodian for over fifty years. The featured postcard, dating from about 1960, is from the collection of Richard Iverson. The house is also called the Weyerhaeuser House, named for lumber baron Frederick Weyerhaeuser and his wife, Sarah. He immigrated from Germany and, in 1856, arrived in this area, where he and his brother-in-law soon formed the Weyerhaeuser and Denkmann Lumber Company. The logs from northern forests of Wisconsin that they floated downriver made their first Rock Island sawmill prosperous, and the firm soon acquired other local mills. The Denkmann family lived in a large house near the sawmill on 4th Avenue and 2nd Street, but the Weyerhaeusers chose their early home in Coal Valley. However after an outbreak of scarlet fever in Coal Valley about 1869, Mr. Weyerhaeuser purchased a brick farmhouse and 26 acres from Joseph and Phoebe Conet, who had operated a “market farm” there, raising seasonal fruits and vegetables. This hilltop farm was east of the Atkinson brickyard just off the County Road in Rock Island. As the city developed, County Road became Elm Street and later 30th Street. The youngest of the Weyerhaeuser’s seven children, Frederick, recalled the original farmhouse, calling it a square, two-story brick house with a small cupola and an extension at the rear, containing the dining room with a maid’s room above. At this time, the main entrance was probably on the north side, where a small entry still remains. The extension lies to the south, but today is larger than expected from the description. The first significant alteration, in 1877, was on the interior when a partition between two rooms on the east side was removed and a bay window was added. This became the living room which, according to Frederick, was one of the only rooms regularly heated in winter. In 1882-83, today’s front or west part of the house was built, incorporating a four story tower, an entrance hall, and rooms to either side. The new Mansard roof, pierced by picturesque dormers, was extended to the original home, making a usable third story. Beneath the eaves, large paired brackets were interspersed with smaller dentil-like brackets. The impressive ground-level front “porch” that conveniently incorporates a porte-cochere was part of that addition as well. 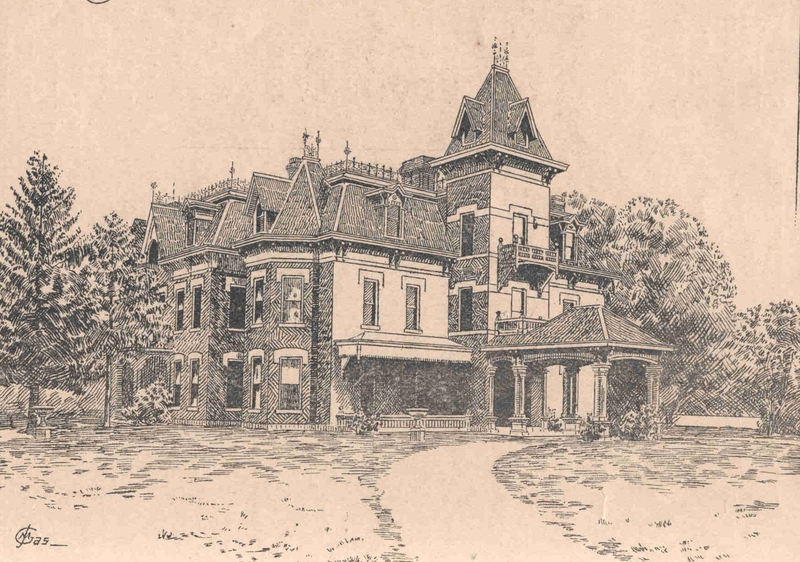 A drawing of the house that appeared in an 1888 publication shows the appearance after that addition. This addition could be the work of local architect Isaac Holmes. Holmes designed many buildings for prominent Rock Island County residents in the 1860s and 1870s and often used the Mansard style roof. One of his hallmarks was a cascading drapery effect for window headers as seen here. Although Holmes died after a short illness in 1881, he may have done design work for the Weyerhaeusers. The Weyerhaeusers were always building. 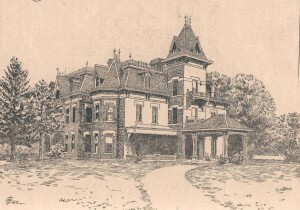 In July of 1885, the Argus reported that Rock Island architect Guido Beck designed an “elaborate barn – one of the finest in the city” this home. In 1888, a magnificent dining room was added on the east side. The parapetted gable of the roofline of this addition is clearly differentiated from the adjacent Mansard. This type of gable was often seen in Rock Island public school designs of the same era by architect Edward S. Hammett. The dining room interior is covered with solid cherry wood paneling containing a multitude of hand-carved flowers. According to Frederick’s recollection, the stained glass window installed there was the work of famed glass designer John LaFarge. After Wisconsin was logged out, the senior Weyerhaeusers followed the trees to Minnesota in the early 1900s. But the home remained in their family, with daughter Apollonia and her husband Samuel S. Davis taking over. Mr. Davis was a founder and owner of what would eventually become Mid-American Energy. The Davises, who had moved from 541 23rd Street, would remain in the family mansion for the next fifty years until their deaths. Mr. and Mrs. Davis undertook the last significant interior remodeling in time for the Weyerhaeuser’s 50th wedding anniversary in 1907. The entire family — parents, all seven children, spouses, and grandchildren — came to Rock Island, to the family home, for that celebration. And the 25-room mansion was big enough to hold them all. In 1954, the Davis son gave the estate, still containing many historic Weyerhaeuser family furnishings from handmade Belgian lace curtains to Oriental rugs, to Augustana. Even the family’s Victorian era clothing remained in the home. Although students now reside in the upper levels, the historic qualities of the home have been well maintained. Augustana has generously opened the home to many community organizations for special events and tours. Former Dean, Betsey Brodahl, who lived in a second floor suite there was an inspired caretaker who shared her love of the house with many visitors over the decades. Thanks to the Weyerhaeuser-Davis families and Augustana College, the House on the Hill looks like it did in the 1880s. It has been listed on the National Register of Historic Places since 1975. This article, by Diane Oestreich, is slightly modified from the original that appeared in the Rock Island Argus and Moline Dispatch on September 2, 2007.